As part of its quest to speed up the Web, Google today added a new Speed Suggestions report to Google Analytics. 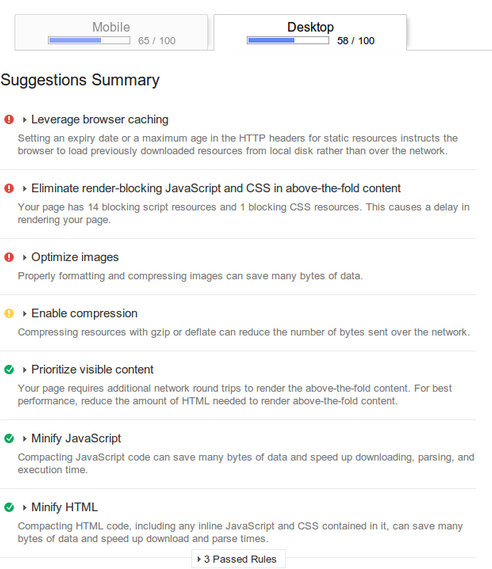 In short, the report offers suggestions how to speed up your site’s slowest pages. The Speed Suggestions report shows the average page load time for top visited pages on your website and integrates with the PageSpeed Insights tool, which analyzes the contents of a Web page and generates a speed score as well as improvement suggestions. The speed score indicates the amount of potential improvement on the page; the closer its score is to 100, the more optimized it is for speed.